I’m very excited to be sharing this recipe with you. It was introduced to me just a few years ago by a family friend (it’s a longstanding Thanksgiving tradition at his family’s table), and I loved it the first time I tried it. 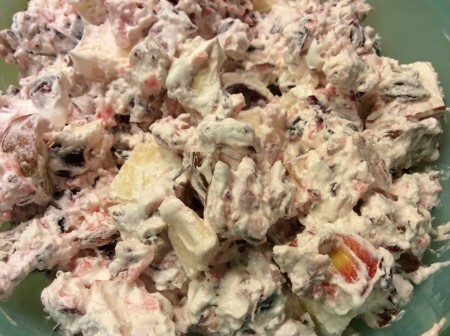 I think you will too, and find many more uses for it besides just at Thanksgiving time, so be sure to whip up a batch of cranberry fluff. Tell me honestly, what’s much better than cranberries, apples, grapes and nuts. These ingredients are all good on their own, so why wouldn’t they be better together? And just for fun, let’s throw in some low-fat whipped cream for good measure to make it all stick together. That’s cranberry fluff, my friends. While my buddy Nate makes it for Thanksgiving with his family, when he shared the recipe with me, I knew it was better than just a once a year appearance. This stuff is delicious – not too sweet, not too tart and with just the right amount of indulgence while still eating your fruits for the day. I made a batch for Thanksgiving and I intend to make some more when we get closer to Christmas. I hope you like it as much as I do – it’s so easy, what’s not to like? Grind the cranberries up in a food processor until they get a rough, chopped, chunky consistency. Cut up the apples into bite-sized chunks. Slice the grapes into quarters or halves, depending on how big the grapes start out. Chop the walnuts or pecans up roughly. Once everything’s slices, combine all the fruit in a bowl and add the whipped cream and salt and stir to combine until it’s all mixed. Serve as a side to Thanksgiving dinner (or breakfast or dessert). Not the fanciest bowl, but we were taking it to my aunt’s house the next day, so travel-safe ware was the priority. How can anyone say no to fruit, nuts and whipped cream? 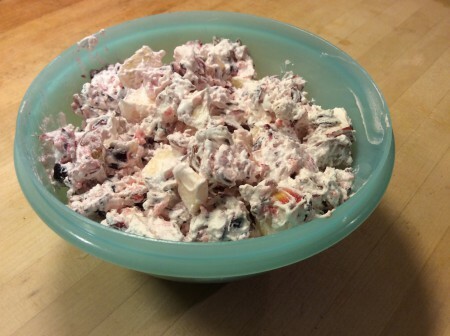 This entry was posted in Breakfast, Desserts, Recipes, Side Dishes and tagged Breakfast, Cranberry, Cranberry Fluff, Desserts, Fluff, Low-fat, Recipes, Side Dishes, Thanksgiving, Whipped Cream on December 17, 2014 by Paige N..